It's a hard thing indeed, to realize that you're past you're prime. 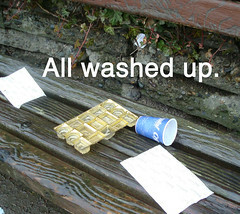 Where once you were the toast of the town, now you're yesterday's news: washed up, aging, without many prospects for the future. But what if--just what if--you could have one more shot at the big time? No, we're not talking about you, Mickey Rourke (although seriously--what's happened to you since Diner?). 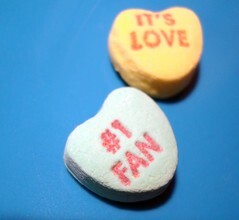 We're talking about Valentine's Day Candy. Just a week and a half ago it was the star of the sweet world--now, half eaten boxes of chocolates are being discarded, and what boxes are left are relegated to sad sales bins, prices slashed. 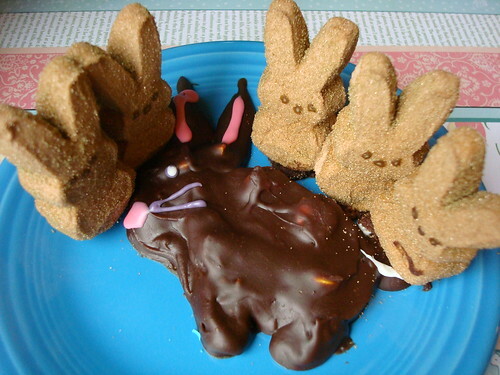 But we know everyone loves a comeback--and so we decided to try to breathe some new life into those leftover chocolates to give them one last hurrah and to bring them up to date with the current sweet scene: and so, we made them into an Easter Bunny. 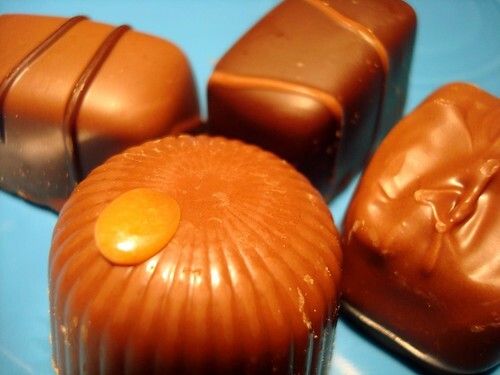 First, we took all of our leftover Valentine's Day chocolates--you know, those weird flavors that are always left--can't say for sure, but think they were vanilla fondant, strawberry cream, and some sort of almond marzipan-filled. 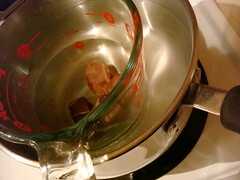 We put them in a water bath to melt them. Of course, having a brilliant idea in the middle of this, we poured in all of our leftover Sweethearts (side note: when did Sweethearts start sounding so stalker-creepy?). 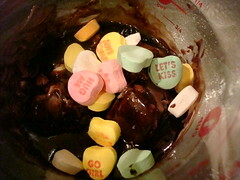 Unfortunately, these sweethearts are pretty much indestructible, so rather than melting they more just became sugary lumps. 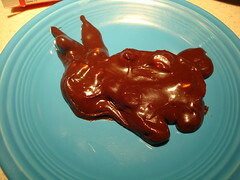 Since we didn't have a rabbit-shaped mold, we then sort of bent a mitten cookie cutter into a vaguely bunny-shaped blob, and poured the chocolate slurry into it. 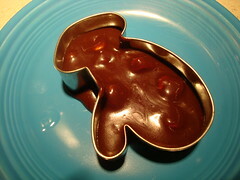 Once it was solid but still malleable, we removed the cookie cutter and added an extra few dabs to form bunny ears. Then, we let it all cool down and set overnight. 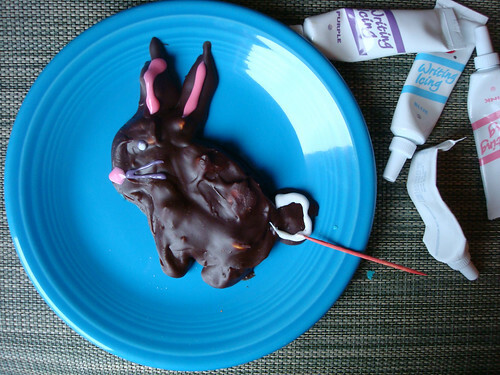 In the morning, we touched it up with some bunnylike features rendered in decorating gel frosting. And then we decided to name it. "Easter Bunny" didn't seem quite appropriate, so we settled on "Mangly". 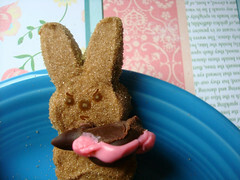 Because certainly, this mangled little bunny had a face only a mother could love. 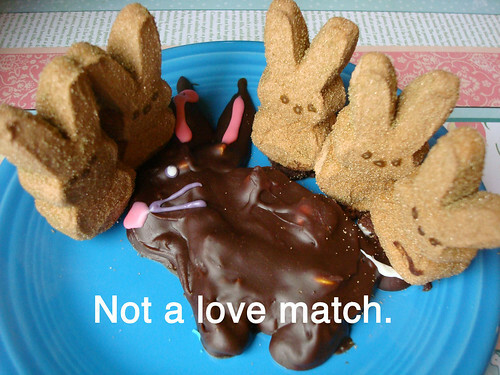 Feeling rather self-satisfied with having helped breathe new life into Valentine's Day candy and fairly holier-than-thou about having a small carbon footprint, we decided to see what other Easter Candy thought of their new peer. Unfortunately, they didn't seem to get along. Maybe they're just jealous. 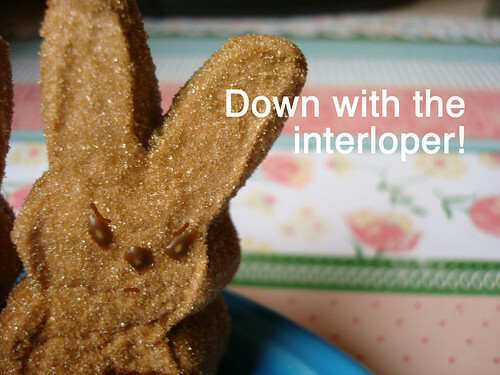 Or maybe they see Mangly the leftover-candy Easter Bunny for what he is: a has-been who is desperately grasping for one more moment in the spotlight. And if this is so, then perhaps it's time to face the fact that there's a season for everything, and unfortunately, the season of Valentine's Day candy has, sadly, passed. Hey, at least we tried. 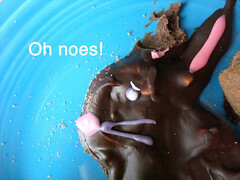 But now, we say bring on the Cadbury Creme eggs and chocolate bunnies!